Weaving on a triangle loom or triloom is fun, creative, easy and quick. You can start weaving as soon as you sit down with the loom, there is no elaborate planning and measuring process. Triloom weaving is also a very efficient way to use yarn, so you can use the more expensive designer, or hand-spun yarns. 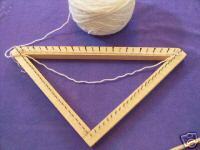 Triangle looms are great for weaving plaid patterns and elegant lace patterns. 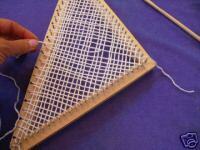 The process is simple to learn, so triangle weaving is enjoyable for adults and children of any age. Using a triloom, you can weave a wide variety of yarns and patterns which can be used for shawls, purses, blankets or what ever you can imagine. Smaller trilooms can be carried with you in your purse or briefcase so that you can work on projects on the bus or during breaks. You can then piece together the small triangles into squares, rectangles, circular geometric shapes or bigger triangles, allowing you to form the fabric for jackets, shawls, blankets, hand bags or what ever your imagination prompts. Triloom weaving uses one continuous strand of yarn. There is no separate warp and weft. To make a pattern, you tie the new thread onto the old one and continue weaving. This saves an infinite amount of time, since you don‚Äôt have to measure out your warp and then thread the loom. It also saves a lot of yarn, since there is no loom waste. Triweaving takes the drudgery out of the weaving process and leaves the fun! Begin: To begin weaving on a triloom, start with a smaller loom, a 12-inch loom is ideal. 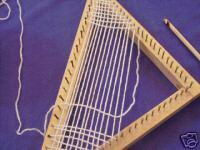 You can find trilooms by searching triangle loom, tri-loom, triloom or triweave on eBay. A triloom with a wider spacing is good, so that you can understand the yarn flow without getting stuck. 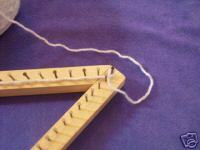 Look for a loom with a 1/2 to 1/3 inch nail spacing on the top row. You also need a weaving hook. For a 12-inch triloom, a nine-inch crochet hook, known as an afghan hook is a great weaving hook. You can also use a latch hook, similar to the ones that you use for making latch hook rugs. 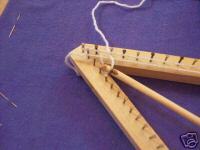 Some of the trilooms come with their own weaving hook. The ones we make do come with their own hook. Start with two contrasting yarns. A bulky wool hand spun is a great yarn for your first project. You need less than 50 yards, total, to make a small handbag on your triloom. You can also use bulky commercial yarns to start out. There is an incredible variety of yarn available. Just search “Yarn” on eBay and you will find enough to set your inner designer free. To start weaving with your triloom, sit at a table, with your loom in front of you. Later, you can triweave with your loom on your lap, but for this first time, it is easier to have the table to set the loom on. Have your yarns, hook and scissors within arms reach. Set the loom on the table so that the long side of the triangle is farthest away from you and the point is nearest your belly. Pick up your first color of yarn and tie a slip knot in the end. Hook the loop of the slip knot over the nail at the top left of the triloom. Run your yarn below the nails along the top of the triloom. Loop the yarn under the nail on the far right side of the top arm, then over, around and back down to the first nail on the right arm of the triangle. 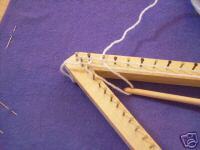 Loop it under that nail, and then back across the length of the loom to the left arm of the triangle. Loop under the first nail on the left arm of the triangle and then take your yarn up to the second nail on the left side of the long arm of the triangle. Go over that nail. Keep your work relatively loose, but not sloppy, it will tighten up as you weave. Now comes the tricky part, and this is where you start weaving. Woven fabric holds together because the threads are intermeshed by going over and under each other. As you weave on your triloom, you need to make sure that if one pass of thread was over the cross thread, the next needs to be under it. So take your yarn, and from the second nail on the left hand side of the top arm of the triangle, go under the first long strand of yarn and over the second one. 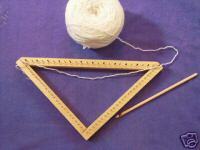 Then hook your yarn under the third nail on the left arm of the triangle. Keeping your loop of yarn below the previous strands, pull it across the loom and hook it under the third nail on the right arm of the triangle. The starting process can be confusing, but don’t worry, you’ll get it. After doing it a time or two, you won’t even have to think about it. Read the description and then look at the pictures. If you have any questions, feel free to send me, jenonthefarm, a message through eBay. I am always happy to answer questions. Hook the yarn over the third nail on the right side of the top arm and using your weaving hook, go under the third cross yarn, over the second and under the first, pull your yarn down through the cross yarns and hook it over the fourth nail on the right arm of the loom. 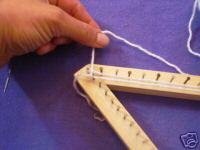 You can use the back of your weaving hook to push the yarn straight. Now you continue the back and forth and up and down weaving until your loom is almost full. Keep your work loose! When you get the the center of the triangle, it will be hard to work the hook in, even if you left the tension of your yarn fairly loose as you were weaving. As you round the last nail on the top arm, pull your loop down and around the center bottom nail. Pull the yarn out an extra two or three inches. Then snip the yarn and pull the tail back out the top. You did it! You just wove your first piece on a triangle loom! To take your weaving off the loom, you just gently pop it off the nails. Because you wove, over and under each strand, your piece of fabric is complete and does not need any finishing to keep it together. There are fancy ways you can finish the edges, or you can use them to join two triangles together. I’ll explain how to do that after you weave your next triangle. You just did your first piece without changing colors. Now, start a second piece, and weave down to the sixth nail. As you come around the top arm nail on the left side, take your yarn and just lay it over your weaving down to the nail on the left side arm. Measure about 3 more inches and then cut your yarn. Tie on the second color. Now, take your hook and continue weaving as usual. The knot where you joined the colors should be on the outside of the nail on the left arm. When you decide to change colors again, keep the knots on the bottom edges. This way you can hide them in the fringes or in the joining. Finish your second triangle and take it off the loom. Take time to admire your work! To join the two triangles, lay them down, matching each other, with your beginning threads at opposite sides. 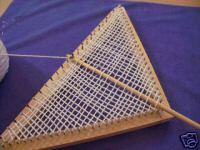 Take your weaving hook and pull the beginning thread of one triangle through the beginning loop of the other triangle. Then, crossing from on triangle to the other, hook the next loop through and then the next loop. 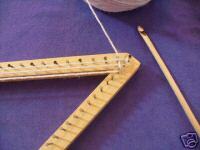 Think of binding off when you are knitting, or making pot holder edges on a pot holder loom. When you get to the opposite side, pull the end thread out through the loop. Congratulations, you have a square! If you make 5 triangles, join them into 2 squares and then stitch three sides of those squares together and join the fifth triangle at the top, you have a beautiful little, unique handbag. Or make triangles for the rest of the summer on your morning commute and by Christmas, you’ll have enough to join together to make scarves or afghans for everyone on your gift-giving list!